Previous studies have noted abnormalities in sodium excretion in women with preeclampsia. Researchers in Brazil recently published a study examining the effectiveness of natriuria testing compared to calciuria testing in patients with various hypertensive disorders in pregnancy, including mild and severe preeclampsia. The study was published in the Sao Paulo Medical Journal. Four groups of 14 women were recruited for the study – normal, chronic hypertensive, mild preeclampsia and severe preeclampsia. All patients underwent urine testing that screened for creatinine, proteins, calcium, uric acid and sodium. Researchers noted a significant difference in values between the control group and patients with severe preeclampsia. 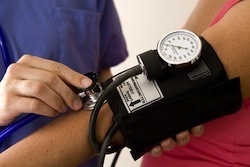 There were also differences in results from the chronic hypertension and severe preeclampsia groups. While natriuria levels were lower in patients with preeclampsia, levels are best assessed in conjunction with calciuria levels. Natriuria levels are not a good sole indicator of preeclampsia. Gasnier R, Valério EG, Vettorazzi J, Martins-Costa SH, Barros EG, Ramos JG. Natriuria and calciuria levels in preeclampsia: a cross-sectional study. Sao Paulo Med J. 2013 Apr;131(2):106-11.